Can a Novel High-Density EEG Approach Disentangle the Differences of Visual Event Related Potential (N170), Elicited by Negative Facial Stimuli, in People with Subjective Cognitive Impairment? Thessaloniki-Macedonia, Greece – Greek researchers investigated whether specific brain regions, which have been found to be highly activated after negative facial stimulus, are also activated in different groups of people with subjective cognitive impairment (SCI), mild cognitive impairment (MCI) and Alzheimer’s disease (AD) compared to healthy controls (HC). The endeavor to detect the very early signs of dementia with the possibility of developing interventions to slow its progression has provided the impetus for increased interest in SCI. In contrast to the literature available on elders with cognitive impairment, the body of evidence regarding emotional processing with brain maturation in SCI is still limited, almost absent especially where emotional processing is concerned. However, scientists from Centre for Research and Technology Hellas/Information Technologies Institute (CERTH/ITI), the Aristotle University of Thessaloniki (AUTH) and the Greek Association of Alzheimer’s Disease and Related Disorders (GAADRD), examined the modulations of HC, people with SCI, MCI and AD on the N170 component during the explicit and implicit processing of negative facial stimulus (“Anger” and “Fear”). The study is published in the Journal of Alzheimer’s Disease. The face-selective N170 component characteristics were used to constrain brain localization, having in mind that a neurophysiologic marker evoked by facial stimuli will reflect differences in the intensity of responses in brain regions specifically devoted to the decoding of “Anger” or “Fear” faces. The focus of the study was to find any potential differences of brain activity as revealed by N170 amplitude and latency among the four groups in grounds of facial emotional processing, which is considered as an important cognitive function, commonly affected in people with cognitive impairment. Overall, 57 participants took part in the study, among them 14 SCI, 17 MCI, 14 AD and 12 HC. All participants went through a standard detailed neuropsychological assessment. The facial stimuli used in the experiment were chosen from Ekman and Friesen’s facial stimuli. Female and male faces with facial expressions were used, displaying 17 “Angry” and 17 “Fearful” expressions. HD-EEG data were collected with the EGI 300 Geodesic EEG system (GES 300) using a 256-channel Hydro-Cel Geodesic Sensor Net (HCGSN). Summarizing the main findings, SCI group compared to HC, had statistical significant larger amplitude to negative faces, while brain activation in frontocentral areas, during N170 elicitation was less than expected compared with HC. Similarly, MCI and AD group exhibited also larger N170 amplitudes while less brain activation, in the respective areas, was observed compared to HC. Supposing that facial processing acts as cue to trigger activation of stored configural representations and memory, the difference in SCI compared to HC may at least partly explain the impaired processing after presentation of negative faces. In contrast to HC, the SCI group exhibited enhanced N170 amplitude for “Fear” compared to the negative emotion of “Anger”. 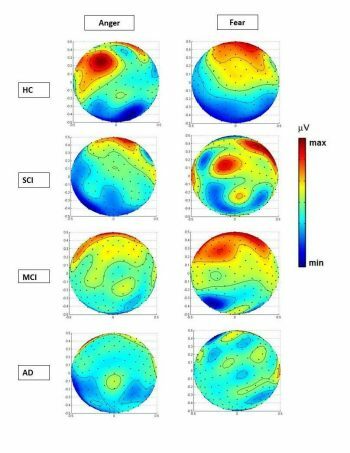 N170 topographic maps differ between the two negative stimuli among the four groups, while less frontal brain activation was noticed in elders with cognitive deterioration compared to HC group (Figure 1). This outcome leads us to believe that cognitive impairment affects fronto-temporal and occipito-parietal areas, which take part in facial emotional processing. These findings pave the way to investigate the changes taking place in neural activation at cognitively impaired conditions associated with neuro-degenerative diseases such as SCI, as prodromal stage of cognitive impairment related to AD and demonstrate an interesting shifting of the location of maximum neural activation for the two negative emotions. More specifically, in the case of “Fear” the maximum intensity level appeared in frontal lobe in the most cognitively intact groups, whereas in groups with cognitive impairment less activity in frontal areas was found, showing that N170 component is generated by “top-down influences”, arising from higher order regions of the cortex. Thus, identifying SCI by N170 modulation may facilitate the planning of future prevention and treatment of cognitive decline associated to pathological cognitive aging, and particular to the processes related to AD. Figure 1: Polar projections and topographic view of spherical spline interpolations of the voltage topography (in microvolts) 170 milliseconds following the onset of the face stimulus for two conditions: Anger and Fear. Full study: Lazarou I, Adam K, Georgiadis K, Tsolaki A, Nikolopoulos S, Yiannis Kompatsiaris I, Tsolaki M (2018) “Can a Novel High-Density EEG Approach Disentangle the Differences of Visual Event Related Potential (N170), Elicited by Negative Facial Stimuli, in People with Subjective Cognitive Impairment?” J Alzheimers Dis 65 (3) (doi: 10.3233/JAD-180223). Full text is available to accredited journalists to request full text from Diana Murray, IOS Press (+1 718 640 5678 or d.murray@iospress.com). Correspondence and questions for the authors can be submitted to Ioulietta Lazarou, Centre for Research and Technology Hellas (+30 2311 257 739 or iouliettalaz@iti.gr). The Information Technologies Institute (iti.gr), formerly Informatics and Telematics Institute, was established in 1998 in Thessaloniki as a non-profit research organization under the auspices of the General Secretariat of Research and Technology (GSRT) of the Greek Ministry of Development. Since 2000, ITI has joined the Centre for Research and Technology Hellas (CERTH). The main objective of the Institute is to be a research institution of excellence, identifying promising fields for the future and creating an environment that will allow the transfer of basic, applied and technological research in the growth of the digital economy of the 21st century. CERTH/ITI has developed spheres of excellence and critical mass in research and technology in several strategically important fields in a number of areas: Image and Signal Processing, Computer Vision, Human Computer Interaction, Virtual and Augmented Reality, Artificial Intelligence, Security and Surveillance, Biomedicine – Bioinformatics, Robotics, ICT for Environment Monitoring, Geosciences and Remote Sensing, Social Network Analysis, Networks and Communications, Cultural and Educational Technology. The Multimedia Knowledge & Social Media Analytics lab (mklab.iti.gr) is part of the ITI and has extensive experience and expertise in semantic multimedia analysis, indexing and retrieval, social media and big data analytics, knowledge structures, reasoning and personalization for multimedia applications, eHealth and environmental applications. MKLab was the co-ordinator of the Dem@Care (demcare.eu), MAMEM (mamem.eu) and CBP projects which supported the presented work. The Aristotle University of Thessaloniki (auth.gr/) is the largest university in Greece. It comprises 7 faculties that consist of 33 schools, 5 faculties that consist of one school each, as well as 4 independent schools. About 81,500 students study at the Aristotle University (72,140 in undergraduate programs and 8,360 in postgraduate programs). There are 2,150 faculty members: 739 professors, 435 associate professors, 634 assistant professors, and 342 lecturers. There are also 11 teaching assistants, 58 research fellows, 248 members of the Special Laboratory Teaching Personnel (S.L.T.P. ), as well as 15 foreign language teachers and 4 foreign instructors. Faculty members are also assisted by 213 members of the Special Technical Laboratory Personnel (S.T.L.P.). The Aristotle University of Thessaloniki conducts research projects, participates in European research programs, cooperates with international institutions and organizations and attracts outstanding researchers from within Greece and abroad. The Aristotle University supports research projects in a wide variety of disciplines related to the environment (natural and built), computing, new technologies and nanotechnology, telecommunications, industrial technologies, transport, biotechnology, biomedicine and health, agriculture, forestry and fishery, education and language, history and archaeology, social studies and economics. The Greek Association of Alzheimer’s Disease and Related Disorders (alzheimer-hellas.gr) is a non-profit organization that was founded in 1995 by relatives of patients suffering from Alzheimer’s disease, doctors of all specialties (mainly neurologists and psychiatrists) and other experts (such as psychologists, social workers, physiotherapists, etc.) who deal with the problems caused by this disease and other types of dementia. The Association operates 2 day centers in Thessaloniki and has over 4.000 members. It is a member of Alzheimer Europe and Alzheimer’s disease International (ADI) and has successfully participated in various national and European research projects producing new scientific knowledge and innovative interventions for cognitive disorders. The aim of the Association is to offer information and advice concerning the care of patients with cognitive disorders and provide services for patients and their families. It also strives to offer help and support to caregivers in order to reduce the social, economic and emotional burden deriving from the long term care of people suffering from dementia. Lastly, the Association attempts to publicize the social needs of the affected population and inform the public on issues related to dementia and cognitive disorders in general.